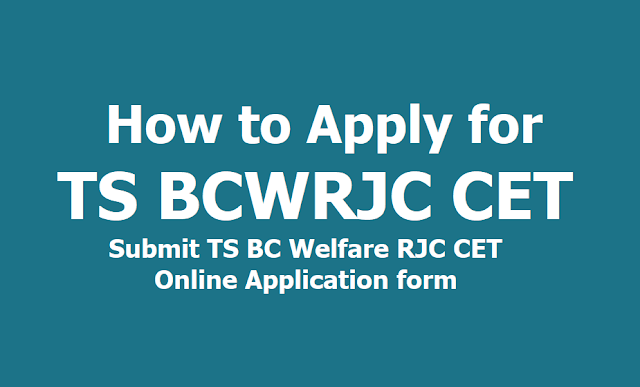 How to Apply for TS BCWRJC CET 2019, Submit TS BC Welfare RJC CET Online Application form. How to Apply for MJP TS BC Welfare RJC CET 2019, Submit TS BCWRJC CET Online Application form. Candidate seeking admission into Intermediate courses at MJPTBCW Residential Junior Colleges for the academic year 2019-20 shall apply for entrance test through online by visiting mjptbcwreis.cgg.gov.in. 33 Districts of Telangana State students are eligible for admission. Date of Entrance Examination: 21-04-2019 in all erstwhile 10 Districts. Question paper booklet contains questions in multiple objective type and questions will be given in English and Telugu versions. • The candidate shall first go through the information bulletin carefully and satisfy their eligibility for appearing for MJPTBCWRJCCET-2019. • The candidate after satisfying himself/herself about the eligibility criteria for the submission of application through online shall pay a fee of Rs.200/- through PAYMENT GATEWAY from 01-03-2019 to 08-04-2019 for submission of application through online. • On receipt of fee through PAYMENT GATEWAY, the candidate shall be issued a journal number with which he/she can proceed with submission of application through online through the website mjptbcwreis.cgg.gov.in. Issue of Journal number does not mean that the candidate has completed submission of application online. It is only a confirmation of the fee received. • Before submission of the online application form, the candidate has to fill up the Model Application form (given in the Annexure). • The candidates shall follow the procedure for submission of online application as given in the 'Information Bulletin' and also as per the instructions provided online while filling up the online application form. The candidate should be ready with photograph of size 3.5 x 4.5 cms before filling online application. The photo should be scanned and uploaded along with the application form. • While filling the online application, the candidate has to opt the Group. • On submission of application online, the candidate has to take a copy (print) of application form in which a reference number also be given. This reference number is required to download the Hall Ticket. • The copy of online application is to be preserved for further reference. • For any mistakes/incorrect information, the candidate is solely held responsible. Hence they must take utmost care while filling the online application. • The selected candidate should produce the original certificates at the time of admission as a proof to the information furnished in the application. • The selection of the candidate will be summarily rejected if they fail to submit the necessary documents at the time of admission.